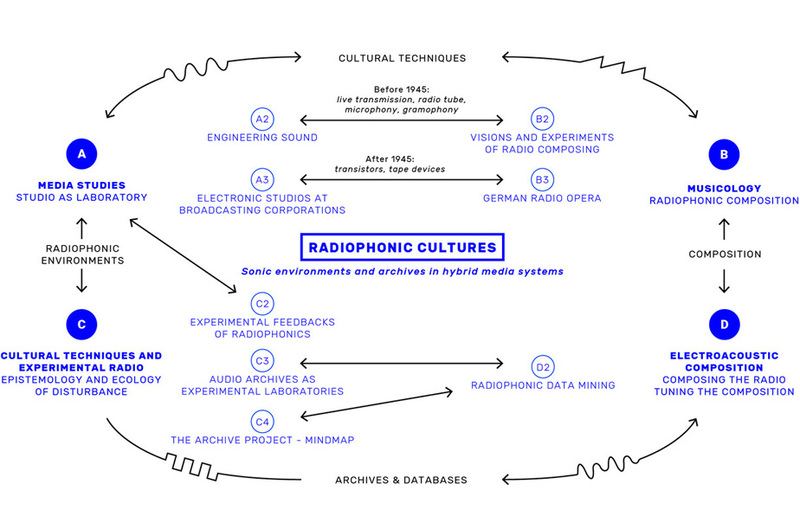 The interdisciplinary research project Radiophonic Cultures explores the emergence of new sonic spaces and cultures of listening in radiophonic arrangements from early radio to its current digital reorganization. Going beyond a definition of the radio as institution, the concept of radiophonics followed in this research encompasses a larger history of the forms of production, composition, transmission, and perception of sounds as well as of the changing conceptions of sound and music that is linked to the radio and its apparatus, technologies, experiments and discourses. The research group, consisting of media scholars, radio researchers, musicologists and composers, examines the mutual interdependencies between technologies of the radio studio, musical composition, practices of archiving and modes of reception. Thus it aims at understanding more closely the impact of radiophonics on sonic environments and communication and grasping the aesthetical and political potentials of a future radio under hybrid media conditions. Leider muss der der Vortrag von Katja Rothe am 13.12. kurzfristig abgesagt werden. Unfortunately the lecture by Katja Rothe planned for December 13th had to be cancelled on short notice. The first volume of the three-volume publication Radiophonics by the Radiophonic Cultures - Vol. 1: Radiophonic Cultures project is now published. This volume, edited bei Ute Holl, presents the current state of the discussion revolving around radiophonics, including its history and possible future, in light of the questions raised during the Radiophonic Cultures conference. The lecture series "Radiophonics - Transmissions Between Waves and Noise" accompanies the exhibition "Radiophonic Spaces" at the Museum Tinguely in Basel in the fall semester of 2018. Supplementing the exhibition the lecture series will negotiate the relations between sound and radio waves and between the technical, asthetic and political dimensions of radiophonics. The interdisciplinary conference “Radiophonic Cultures”, which takes place from May 7th till 9th 2018 at the Museum Tinguely in Basel, investigates the history of radio and its sounds as a history of the tensions and interactions among its technical, aesthetic, and political dimensions and thus plumbs the depths of future radio’s potentials.